If you listen closely to most optimistic discussions about the future of retail, you’ll sense an underlying fear. It’s a fear that manifests in an over-reliance on futuristic technological advancements (Oh look, holograms are coming!) or on filling the room with exciting new statistics about the continued dominance of ecommerce — such as how online sales will continue to shatter records in 2018. Meanwhile, the elephant in the room is standing center stage and wagging its trunk for all to see. Grand predictions and superlatives about the ecommerce space can’t mask the audience’s feeling and understanding of some hard truths: Gymboree and Toys R Us are only a couple examples of the retail chains that have filed for bankruptcy recently. Some fundamental aspects of the traditional brick-and-mortar retail experience are crumbling. Enter Virtual Reality. It’s the latest and most beloved of potential saviors of retail, and the narrative is being pushed in articles at Forbes and just about everywhere else. It’s easy for analysts and retailers to hang their hat on this one. After all, when Facebook’s Mark Zuckerberg says his goal is to get one billion people into VR (and he’s pricing the Oculus headset at $200 to do it), it’s easy to get excited about VR’s potential impact on retail. But there’s only one problem. The entire narrative is bolstered by the widely-held assumption that retail is dying. Retail isn’t dying; it’s evolving. And thinking another cool toy on the market will be its liferaft is like refusing to use the self-checkout line in a supermarket so cashiers can keep their jobs — it’s noble in spirit, perhaps, but misguided. Here’s what we know about retail right now: the industry is healthy and growing, and signs point to this trend continuing. According to IHL Group — a global research and advisory firm for the retail and hospitality industries — ecommerce sales rose 12.1 percent in the second quarter of last year, and overall retail sales grew by 4.4 percent. And this is in addition to retailers opening up over 4,000 stores in 2017. Such statistics are often framed as a way to “debunk the myth” that retail is facing challenges as well, even as other reports highlight how major retail chains have closed over 5,000 stores this year. The truth is that growth and loss are happening simultaneously, but growth is winning. The future of brick-and-mortar retail will include all types of changes. These include stores experimenting with new ways of being: becoming community gathering places, as Apple is doing with its new flagship store in Chicago; blending the residential and retail experience as Restoration Hardware is doing with its new Toronto store; and, yes, embracing enticing new technologies such as holograms and VR to bring a bit of excitement to the shopping experience. Let’s be honest, sometimes we don’t want to deal with a human interaction. Sometimes we’re multitasking, in between things, and we just want to use our smartphone to self-shop and checkout on our own. In those moments when I’m on the bus, or at the office, or just need to make a quick buying decision, efficiency is what I’m looking for in my experience as a customer. At its core, the in-store shopping experience is intensely personal. We go to stores when we don’t feel like placing a virtual bet that something will look good or fit. When we go into a changing room, it’s the fit that ultimately matters — even if the customer service associate was the best and even if we strapped on a VR headset beforehand and were transported, while wearing our new outfit, to our dream destination. It’s the way the fabric drapes on our bodies, how confident we feel in it — all of those seemingly infinite questions we’re able to intuitively answer through a physical, tactile experience. 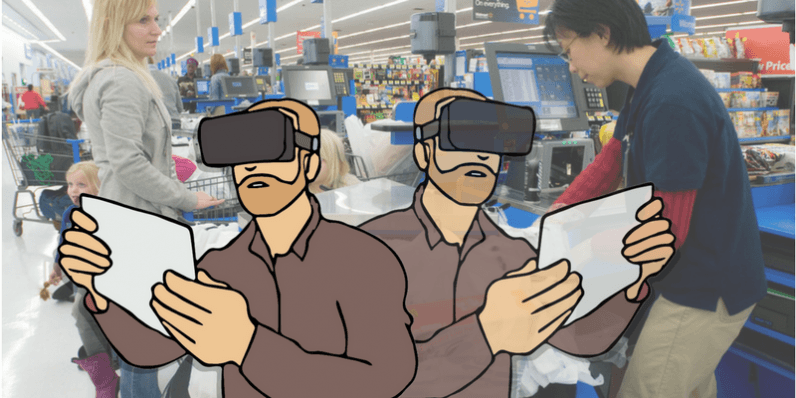 VR can help us visualize sizes and spaces, could help emerging personal shopping companies such as Stitch Fix and TrunkClub, and it may smooth out a few corners in the retail industry, but it’s not going to help in those highly-personal moments when decisions are made. When you have a hammer, everything looks like a nail. And when you have a VR headset (and have bought into the narrative that retail is dying) it can seem as though you’re holding the answer to every retail challenge in your hands. We’re in the age of the customer, and customers quickly fatigue of new technologies that “wow” them at first sight but aren’t able to actually improve their overall experience. Research continues to show that customer expectations are rising, and all retail data points to how consumers are continuing to spend. Retailers that spend too much time trying to force a practical use out of technologies that “wow,” may be losing sight of what their customers are asking for right now.